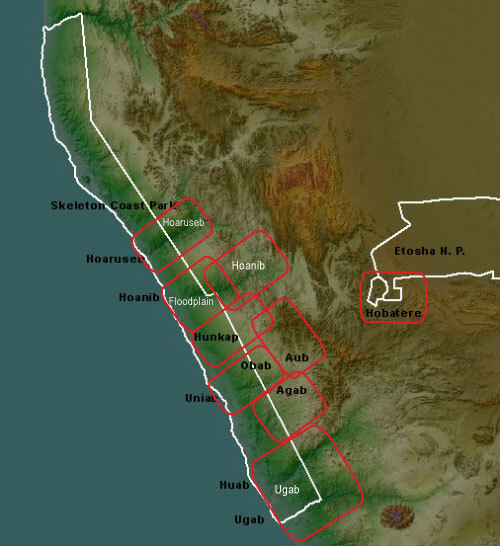 The Desert Lion Conservation Project covers an area of 51,380 km2 in the Kunene Region that includes the Palmwag, Etendeka & Hobatere Concessions, the Skeleton Coast Park, and bordering Communal Conservancies. 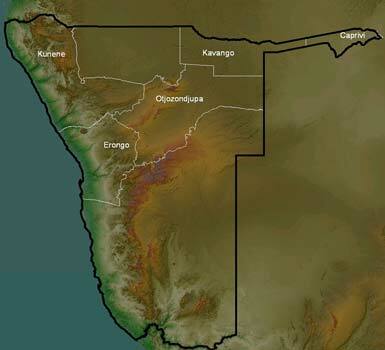 In Namibia lions distribution is restricted to Etosha National Park, Kaudom Game Reserve, parts of the Tsumkwe Districts, the Kunene Region, and the Caprivi Region. This vast area, consisting of protected areas and hyper arid environments, is home to a population of about 150 wild lions. Yet it is thanks to the 28 years work of Professor Stander that this threatened population has grown from about twenty lions at the program beginning to 150 today. This increase in the population of lions is not going without conflict with local populations. Lions attack their livestock, and, in retaliation, rural populations kill lions by shooting or poisoning them. TENDUA supports the Desert Lions Conservation project which different aspects are presented below. Lions are easily recognizable : they have a tawny coat, creamy underbellies and tufted tails. Males have manes and are powerfully. They have five digits on the front feet and four digits on the back feet, with sharp claws that are fully retractable. Lions are the largest carnivores in Namibia. Adult male lions weigh between 160 -240 kg and adult females 100 to 170 kg. The tracks of male lions, presented here, are larger than those of females. The front foot is much wider than the back foot. Average measurements for males are presented (width x height) : front foot - 129 x 138mm and back foot - 118x 137mm. The lion is the only truly social member of the cat family, living in prides numbering from 4 -30 animals. The pride sizes and home ranges depend on the availability of food. When prey is abundant prides tend to be larger and home ranges smaller. Up to four adult males live with a pride. Sub-adult males disperse from their natal pride to become nomadic or form small coalitions. Lions are most active at night when most of the kills are made. During the day they rest in the shade. After a gestation period of 104 - 110 days, litters of 1-6 cubs are born in a secluded spot such as thickets or long grass. The cubs are hidden at first and join the pride after 3-6 weeks. Lactating lionesses will allow other cubs in the pride to suckle. Mortality of lion cubs is high at 80% and is mostly due to starvation. Independence is reached at 3 to 4 years old. Male lions can live for 10 to 12 years and females from 12 to 16 years. Mortality of adults is mostly human related through poisoning, trapping and shooting. Starvation resulting from injury is another factor. Oestrus is often synchronised resulting in synchronised births. Females share the raising of the cubs, resulting in improved cub survival during synchronised births. As a social animal, the lion offers a rich palette of sounds and attitudes that enables him to interact with other members of the pride, whether to express his feelings (anger, anxiety, contentment. ..) or inform the intruders that they are not welcome. The lion’s roar is famous, and it is thanks to the flexible cartilaginous structure of the body supporting the larynx and the shape of the vocal cords. The lion can not actually roar until the age of 2 years. The scope of the roar is at average of 5 km. In addition to its roar, the lion is not stingy in communication: one recognizes at least eight other distinct sounds: grunts, growls short or prolonged, sniffing, soufflements, yelping, “meows” and “squeaks” of cubs. These are all ways for lions to reassure them, communicate and express their concerns, their anger or contentment ... And beyond the “oral” language of lions, just as our domestic cats, they have a complex body language, facial expressions ​​and postures for the delight of photographers! 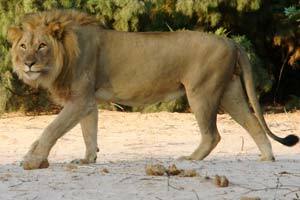 Human-lion conflict is arguably the biggest threat to lions in Namibia, and elsewhere in Africa. There is need for proactive management of human-lion conflict to ensure the long-term conservation of the species. 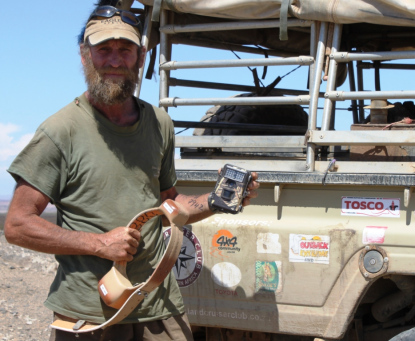 In 1998, Docteur Philip Stander started an intensive research project on the desert lions, termed The Desert Lion Conservation project, aiming to collect sound ecological data, to address human-lion conflicts, and to develop a conservation strategy. Applied research and sound scientific data on lion movements and dispersal, and the ecological mechanisms that regulate the population are fundamental to this process. Lions are fitted with radio collars and are tracked and observed to record behaviour, movements, grouping patterns, reproduction and mortality. Lions are tracked using GPS and satellite technology, a light aircraft (fitted with radio-tracking equipment) and by vehicle. Direct observations and monitoring lions in the field for extended periods are the primary means of collecting data. Lions over the age of two years are marked or radio collared, and individual records are kept of all lions in the population. Emphasis is placed on monitoring lions that disperse and occupy new habitats, and on those that live near local communities. Human-lion conflict is addressed by developing localised conflict management plans. Dr. P. Stander is the expert the most recognized for felines, especially the lions adapted to the Namibian desert. It is the only one working full time on the population to which he devoted the last 14 years. Doctor of the University of Cambridge in 1994, his thesis on the social evolution of felines has been awarded the prize “TH Huxley” of the Zoological Society of London (LZS). He worked 28 years at the Ministry of Environment and Tourism of Namibia (MET), and was in charge of the study of large carnivores of the Etosha National Park in Bushmanland and the Kunene region. The 2nd lioness Xpl17 equipped with a collar, born in 1995, dead in 2008. We know she had at least 5 litters and 8 cubs raised to adult lions. 1. Collect baseline ecological data on the population dynamics, behaviour, and movements of lions. 2. 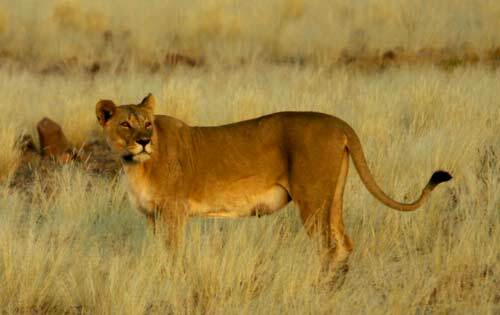 Monitor the key ecological & biological parameters of the desert lion population. 3. Monitor the frequency & impact of conflicts between people and lions. 4. Develop & implement human-lion conflict management plans at local community level. 5. Develop & promote specialised lion eco-safaris and other forms of sustainable utilisation. 6. Collaborate with Government, local communities, and NGO’s to further lion conservation. 7. Make important information available to the world, through publication and the Internet. As a species, the lion is highly adaptive and resilient. 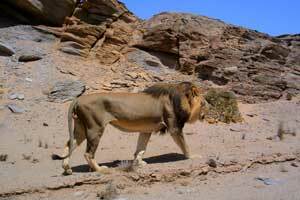 Current research findings demonstrate that Desert lions can survive in extreme conditions. They do not need to drink water and feed on gemsboks, ostriches, and occasionally on seals. They breed rapidly under ideal conditions and are quick to expand into areas of suitable habitat. How to address human-lion conflicts ? 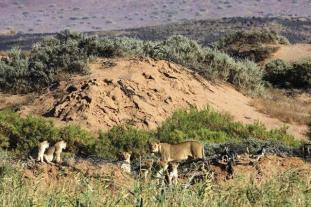 Desert-adapted lions in Namibia occur mostly outside protected areas in the Kunene Region. The unique landscapes of the northern Namib Desert, abundant wildlife, and high levels endemism, makes the Kunene Region an important area for tourism. The lion is an important flagship species for the growing tourism industry. Although the desert-adapted lions are valuable to tourism, the local communities have to share their land with these free-ranging large carnivores. Lions often prey on domestic livestock and farmers respond by shooting or poisoning lions, to protect their livelihood. The local communities have to bear the costs of living with lions, but they do not always share in the benefits from tourism. There is a need for sustainable-use of lions through eco-tourism, with tangible benefits to the communities, and for proactive management of human-lion conflicts. The conservation of lions in the Kunene Region is therefore essential to address Human Lion Conflict, and to conserve a flagship species for the tourism industry. The Kunene Lion Project contributes to this process by studying the density, demography, and population ecology of lions. Through applied research and monitoring, the study collects sound scientific data to guide management strategies and the implementation of a National Lion Conservation Strategy. 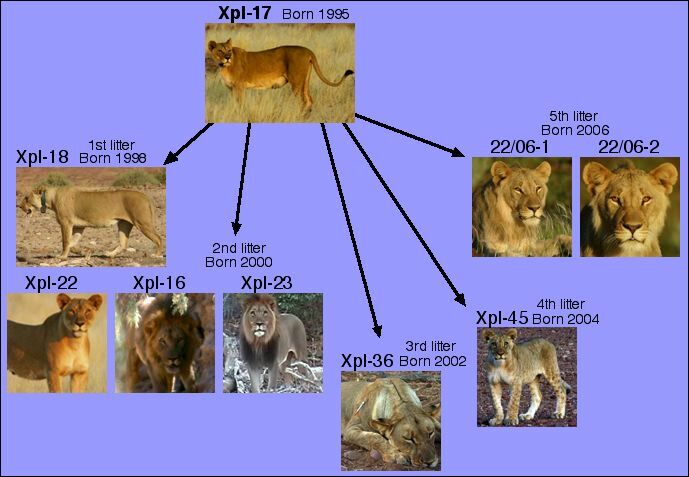 Namibian lions have been studied and monitored intensively since 1980 (Junker & Stander 2001). The Carnivore Atlas (Stander & Hanssen 2004) estimates a population of 562-894 lions in three density distribution categories (below). There are five sub-populations, and only the reintroduced population (Kalahari Game Lodge) is isolated. The low-density distribution area represents both resident lions, at low density, and nomadic or dispersing lions. There is good evidence of lions moving between the Kunene/Etosha sub-populations, and between the Caprivi/Kaudum sub-populations. The two western sub-populations are effectively cut-off from the east, where lions form part of a larger population linking southern and East Africa. Monitoring of key ecological parameters is essential for conservation. There is a need to implement monitoring programmes for all four sub-populations of lions. A basic monitoring design is proposed for each of the four sub-populations. The lion prides, sub-groups and individuals fitted with GPS collars are divided into nine areas. This division is based on lion grouping patterns and movements during the past 12-15 years, habitat and the ephemeral rivers. The map below indicates the approximate areas of the nine main groups of lions. The lion population in Africa is strongly declining due to human activities: farming and urbanization of the savannah as a result of high population growth. Lions are classified as a VULNERABLE species by IUCN, which means an high risk of extinction in the wild. Estimates range between 20 and 25,000 lions when there were at least 100,000 in the 60s. Some wild lions prides are trying to survive in Mali, Somalia, Kenya and Namibia. Parks, such as Kruger in South Africa, are “managing” the largest populations (10% of the total population only in the Kruger Park).